Elkins Physical Therapy and Sports Injury Clinic is dedicated to helping athletes of all ages and abilities maximize their rehabilitation after a sports related injury. Our approach to physical therapy and sports medicine is simple, but effective. Our expert team designs a specific program for each and every individual athlete to meet their exact goals. We fully understand that each athlete is unique, the injuries that he or she endured are unique and their needs will also be unique. This is why our experienced and educated team will develop a unique comprehensive plan that will progress with the athlete to get them back to their pre-injury state safely and effectively. Our proven methods promote healing that is natural and therapeutic. If you have endured a sports related injury and are looking for an experienced team to get you back in the game, give us a call today or fill out our contact form at your convenience. 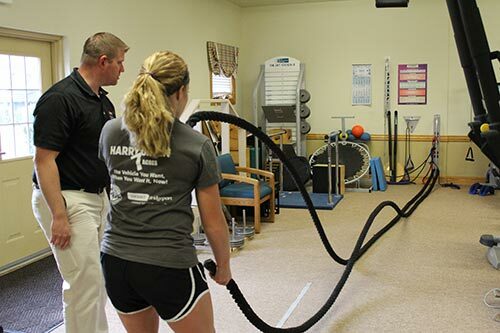 A main goal at Elkins Physical Therapy and Sports Injury Clinic is to educate our athletes about their injury and work with them on strength training, flexibility, and endurance to ensure that they have the tools they need to help remain injury free. Sports injuries can and do happen to even the most seasoned athlete, but an educated athlete can help try to eliminate unnecessary risk associated with their sport. Through this relationship with our athlete patients we have gained their trust and have built many lasting relationships. If you are looking for a reliable and trusted team dedicated to helping athletes recover and excel in their sport, give us a call today, or fill out our Contact form for a fast response.